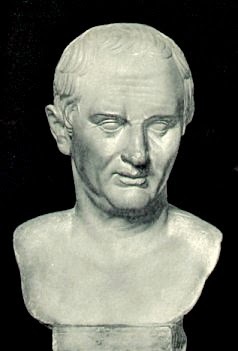 They’ve always called me Cicero, after the famous Roman orator. Actually, I’m not a Roman nor an orator even though I do have a lot to say. I guess my humans named me Cicero because I talk a lot. Well, at least I try, but no one can ever seem to understand what I’m trying to communicate. I worked hard for a long, long time to let them know what was really going on with my former human, but they just couldn’t hear me. If they had, some deaths and a near death could have been prevented in A Broth of Betrayal. My former master wasn’t a bad man. At least I didn’t think so at first. He was always kind to me, but I knew the things he had been up to. He didn’t exactly tell me face-to-face, so to speak, or maybe I should say face-to-snout, but he used to mutter and talk to himself a lot and I was able to figure it all out. I realized what he had done and what he planned to do. He had become a very twisted human. Everyone thought the sounds I was making were so clever. But I was just frustrated. I was doing my best with my (unusual) language skills to let everyone know what my former human was planning but I couldn’t get anyone to listen. Well . . . if you’ve read A Broth of Betrayal, you’ll completely understand what I’m saying. You’ll already know the whole story, except for my part in it. If they had only listened to me the whole mystery could have been wrapped up very quickly. I own a new human now. His name is Horace and I like him very much. He adopted me after all the things that happened in Snowflake, Vermont and I finally have a wonderful and happy home. You’ll see me every so often at the By the Spoonful Soup Shop when Horace brings me there. 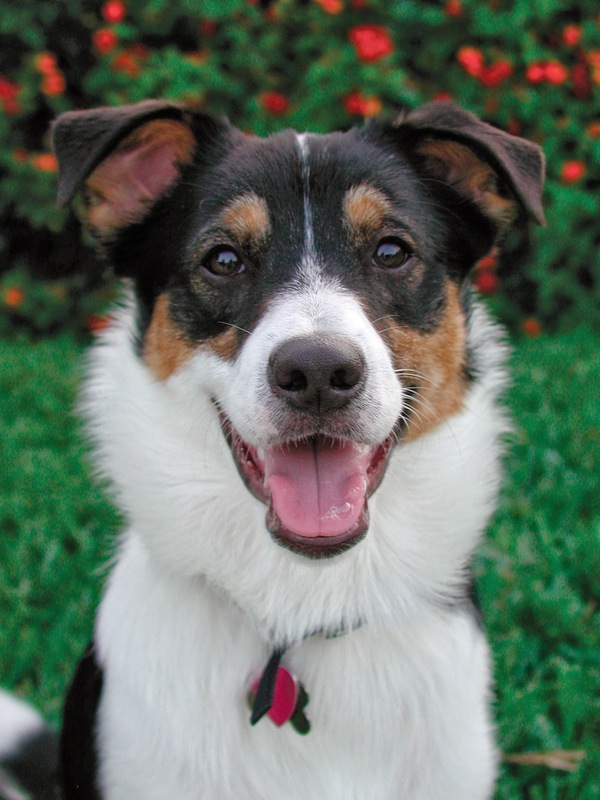 I like to go to the soup shop because I always get a treat – chicken’s my favorite! I still talk a lot and all the humans still think it’s very clever. I don’t really need to tell them anything urgently anymore, but I guess I’m just in the habit of talking. Maybe Cicero wasn’t such a bad name for me after all, even if I’m not a famous Roman orator. 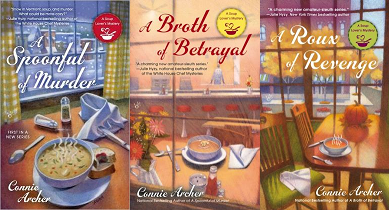 Connie Archer is the national bestselling author of the soup lover's mystery series from Berkley Prime Crime: A Spoonful of Murder, A Broth of Betrayal and just released A Roux of Revenge. Sally: Humans think that Tally's whining sounds like human words. Tally: Sally can bark really fast. Humans listen. I suspect the animal kingdom is a lot smarter than we are. And they have telepathy too! Ever notice how cats never "talk" to each other? They have no need. Cicero is a great name. You should be proud to be part of such a great cozy series. Oh, I am proud to be a resident of Snowflake, Vermont and I get lots of attention and treats when I visit the Spoonful! Good to hear from you, Annette! Glad you appreciate my noble name!